The poster points to an online form to apply for work at the coming North Albany IGA and Ace hardware store. 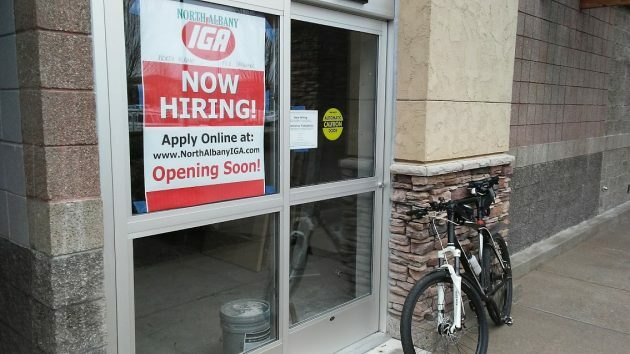 It won’t be long now, judging by the “Now Hiring” posters inside the doors of the forthcoming North Albany IGA supermarket and Ace hardware store. The posters went up in the last few days as work continues on remodeling the inside of the former Ray’s food store in the North Albany Village shopping center. North Albany has had no supermarket since Ray’s closed in 2013. It’s been more than a year since Tyler Myers of The Myers Group in Clinton, Wash., told me of his company’s plans to open a grocery and Ace hardware store at North Albany Village. At the time he expected he might be able to open by the spring of 2017, but this proved wildly optimistic. The hardware part of the enterprise will have an outdoor greenhouse on the west side of the building opposite the OSU Credit Union. As of Tuesday, construction of that addition had not yet begun. Supporters of the store organized a Facebook page (facebook.com/navgrocerycampaign) with regular updates. According to a recent posting, the company told them they still don’t have a firm opening date but hoped to be open by some time in April. Exciting! A short but nice update HH! Thank you. Your last sentence is spot on! Reserving judgment on the pricing however. It was reported a while back that the YMCA would try to find a small grocery store to build on the property they own where the old YMCA was torn down. What happened to that plan, Hasso? We haven’t had an Ace in so long. It will be nice not to have to drive to Corvallis to go to a non-evil big box hardware store.